Known for its close-up encounters with dolphins and whales, SeaWorld San Antonio has recently expanded thrills of a different kind. 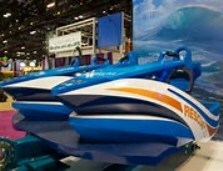 A new ride called Wave Breaker: the Rescue Coaster launched mid-June to the delight of theme-park afficianados. Wave Breaker combines the excitement of a roller coaster with the adrenaline rush of a marine animal rescue mission. Inspired by 30,000 rescues accomplished by the Sea World Rescue Team during the past 50 years, the ride is designed with jet-ski-style cars that passengers straddle and grip handle bars while racing through a series of high-speed maneuvers. My husband Larry and 10-year-old granddaughter Danni recently experienced this exciting ride that includes a pair of pulse-pounding launches over water. Being the smarter grandparent (roller coasters have never been my thing), I chose to take pictures of the two zooming along 2,600 feet of track. Despite Danni giving her lungs good exercise during the ride, the design enables guests to experience what racing alongside the animal care team might feel like when a call comes in for rescue. It’s an exhilarating three minutes of constant motion. If you love roller coasters, also try 360 degree flips on The GreatWhite or Steel Eel, the tallest roller coaster at SeaWorld. Both attractions will get your adrenaline revved up for sure. Height restrictions apply—and nerves of steel are good to have. But if you prefer a slightly slower pace—and don’t mind getting wet--check out Journey to Atlantis or the crazy twists and turns of Rio Loco. These rides will cool you off quickly with a full body soaking. Lines are typically not as long, but they still deliver thrills for all ages. Within half an hour of entering the park soon after it opened, we had ridden each of these two times. Shamu Express accommodates families with young visitors just learning about thrill ride experiences; and there’s an interactive three-acre playground of age-appropriate rides and attractions for the smallest guests. are hanging on as Wave Breaker starts its exhilarating ride. There’s plenty to experience at SeaWorld San Antonio if you like action-packed attractions. But that’s just one part of the marine park’s entertainment. In future posts I’ll tell about other things to do and SeaWorld’s mission to protect and care for animals and teach visitors about natural wonders of our world. Photos by Beverly Burmeier and SeaWorld San Antonio.